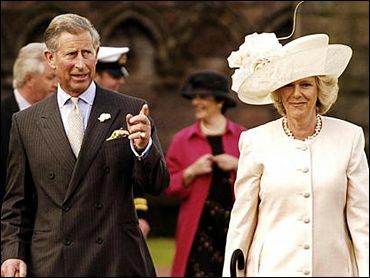 Former Archbishop of Canterbury George Carey believes Prince Charles and his longtime love Camilla Parker Bowles should get married, according to an interview published Wednesday. "He is heir to the throne and he loves her," Carey told The Times newspaper in an interview published Wednesday. "The natural thing is that they should get married." Charles' office has said repeatedly that he has no plans to marry. The Church of England has stayed neutral on a marriage between Parker Bowles and Charles, who divorced Princess Diana before her death in 1997. It's a sensitive issue because Charles would be the supreme governor of the church if he succeeds to the throne, and some Anglicans remain opposed to remarriage of divorcees. The Church of England recently revised its rules to allow divorcees to remarry in church in some cases. Until the change, he could not have married her in church, as her former husband Andrew is still alive. "The Christian faith is all about forgiveness. We all make mistakes," said Carey, who has spoken sympathetically of Charles in the past. "Failure is part of the human condition and there is no doubt that there has been a strong loving relationship, probably since they were very young, that has endured over the years," he added. Carey and his wife Parker Bowles at their son's London home, after becoming worried that she was being demonized by the media, the Times says. "I got very concerned that she was an ogre in the eyes of the media," he told the paper. Carey described the divorced Parker Bowles as "a very nice person, she's very bright, able, astute, tough, very pleasant company." The former archbishop has previously described Charles as more sinned against than sinning in his marriage to Diana. He said the late princess was "a very fallible lady and very angry about the relationship and yes, I do believe, on balance, that she was a little more cunning at using the media than Charles."